Mercedes-Benz trucks on display in 2012 at a pre-IAA Commercial Vehicle Show event. Daimler, as the largest of the truck makers involved in the EU investigation, also faces the largest fine. Photo by Sven-Erik Lindstrand. UPDATED -- The European Union is fining five truck makers nearly 3 billion euros for acting as a cartel to fix prices of medium and heavy-duty trucks and time the introduction of technologies to comply with emissions rules. It’s the highest fines ever imposed by the EU for a single cartel — twice the previous highest amount, imposed in 2012, according to Margrethe Vestager, the European Union’s competition commissioner, in a statement. MAN (now owned by Volkswagen), Daimler, DAF (owned by Paccar), Iveco and Volvo/Renault, which together account for around nine out of every 10 medium and heavy trucks sold in Europe, had been working together for 14 years, from 1997 until the European Commission’s investigation in 2011 put a stop to it. MAN alerted the EU to the cartel’s activities and got full immunity from fines. Volvo/Renault, Daimler and Iveco also cooperated with the EU and had their fines reduced. Daimler faces the largest single fine, slightly more than 1 billion euros, also a record. The five truck producers now have three months to pay the fine. 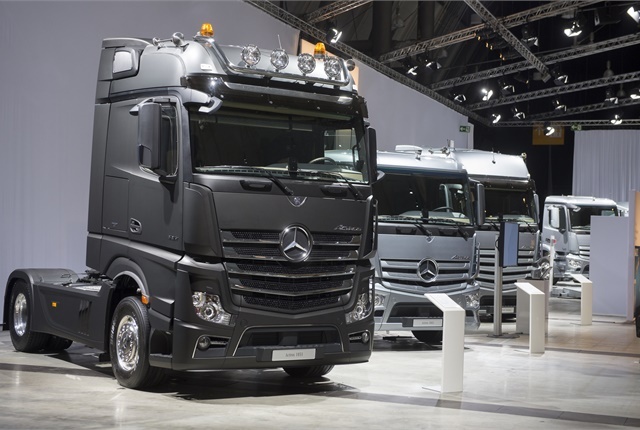 However, the case has been under way for some time and most if not all of the truck makers, including Daimler, Volvo, Paccar, and CNH (parent company of Iveco) had already been setting aside funds to cover the anticipated fines. Daimler had set aside 600 million euros back in 2014, and last week announced it had set aside 400 million for unspecified legal costs, so it already has accounted for the 1 billion. In response to a query from HDT, Daimler officials confirmed that a settlement has been reached with the EU Commission in the antitrust investigation and noted that the company had cooperated in full with commission. The approximately 1 billion euro fine is partially based on the company’s related revenue during the period of the violation. "Daimler regrets these occurrences and took appropriate action some time ago," according to a statement obtained by HDT. "Daimler takes its responsibility with regard to competition law very seriously and has taken all appropriate measures to ensure that all employees act in compliance with applicable law. The company has strengthened its internal controls and has intensified its regular and comprehensive employee training with regard to antitrust law and competition law." In a press release announcing its settlement with the EU, Volvo noted that its 670 million euro fine is mainly covered by provisions made in 2014 and 2016. However, another provision will have a negative impact of 20 million euros on its third-quarter 2016 operating income. “While we regret what has happened, we are convinced that these events have not impacted our customers,” Lundstedt said. period from 1997 to 2011. Senior managers from the truck makers first met in Brussels in January 1997, and for seven years met frequently, sometimes at trade shows or other events, according to Vestager. Starting in 2004, the cartel was organized at a lower level by the truck producers' subsidiaries in Germany. According to EU officials, the companies were coordinating with each other on increasing the gross list price of trucks, as well as how to respond to the increasingly strict European emissions standards, when to introduce the new emissions technologies required, as well as the pricing for them. “Delaying the introduction of environmentally friendly technology in agreement with competitors is not my idea of competition,” Vestager said.